And get excited about dinner again! Do you know what you’re having for dinner tonight? Are you bored with the same old recipes, week in and week out? One thing I hear from my readers all the time is that they are stuck in a recipe rut. They’re bored with the same recipes they’ve been making over and over. …too much inspiration. With sites like Pinterest and Yummly we have millions of recipes at our finger tips, yet we still don’t know what to make for dinner. I’m guilty of pinning hundreds of recipes that I mean to try but never really get around to it. …too much information. We know we need to eat better. Whether that’s incorporating breakfast back into your diet or adding more whole, clean foods to your meals. …too much to do. Our schedules are jam packed, leaving little time to eat, let alone prepare wholesome meals for our families. 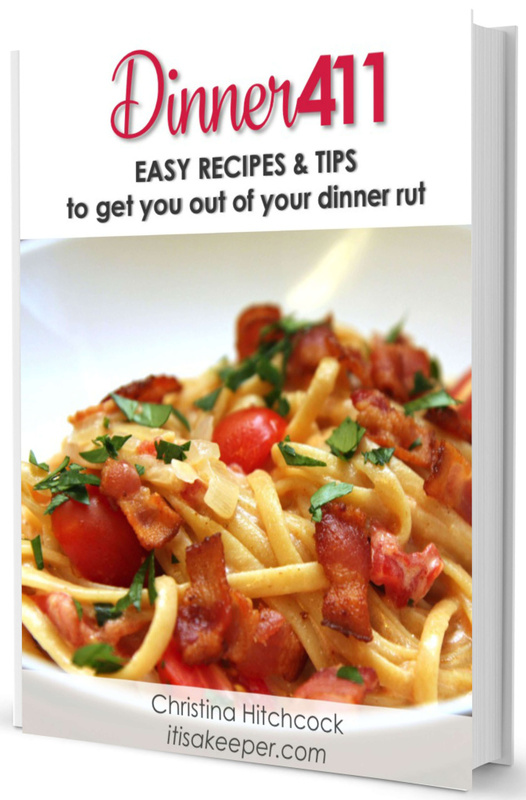 of the Dinner Rut is chocked full of recipes that I have personally tested and have deemed “keepers”. I’ve put my recipe hoarding skills to use and continually scour cookbooks, websites, basically anywhere I can find a recipe, for delicious and easy to make recipes. Are easy to make. Afterall, who’s got time for a 90 minute recipe on a Tuesday?!? Use common ingredients you can easily find at your local grocery store. Taste delicious. There’s nothing worse than trying a new recipe that looks incredible only to find out it tastes like slop. Ain’t nobody got time for that! Ready to take control of dinner? It’s only $4.99! Let me help you love dinner again. Step-by-step instructions for getting dinner on the table…FAST! Seven chapters of immediately actionable strategies and 25 quick and easy recipes. Not sure if Dinner411 is for you? Get a FREE sample from the book! Sample section download link will be sent straight in to your inbox.